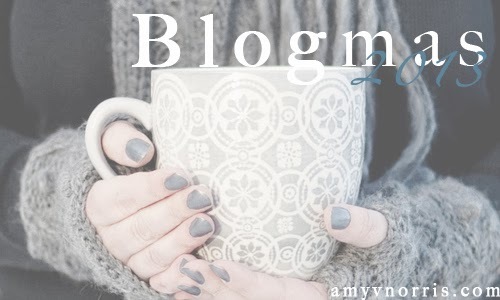 Blogmas is exactly what I needed at this point in my "blogging career" to help me get back on track! Similar to how YouTubers do "Vlogmas" every year, I'm participating in Blogmas and posting everyday from now until Christmas. Thanks to the fabulous Amy for starting this trend! I desperately need to get back into a regular workout routine. With working a demanding nine-hour retail shift nearly everyday, the only way that I'm going to be able to get enough sleep and still have time to workout before begin work everyday is to get used to a better sleep schedule. I'm forcing myself to go to bed before twelve every night and get up before eight at the very latest every morning. Not only do I want to make it a priority to post everyday, but I want to make sure that all my posts are original, fresh and creative. Something I've realized that makes me enjoy one blog over another is the real life pictures instead of generic pictures that anyone can find on Pinterest or Tumblr. I want my blog to represent me, of course, and the best way to do that is to use pictures from my daily life. No explanation needed! This is hands down my favorite time of year, and I love everything from the decor, the music and the snow to buying gifts and watching tacky Hallmark Channel movies that you just can't tear your eyes away from. Looking forward to relaxing, working and saving up money for next quarter and spending the holidays at home with my mom, dad and sister!